Seahorses are true beauties of the ocean. Their elegant swimming style and courtship dance never fail to captivate. Seahorses have many unique features, the most remarkable being that the male becomes pregnant and gives birth. The female transfers her eggs into the male’s pouch where they are nurtured for 30 days. Depending on species there are around 300 babies born per birth, although Seahorse Australia has recorded Potbelly seahorse broods as large as 1116. 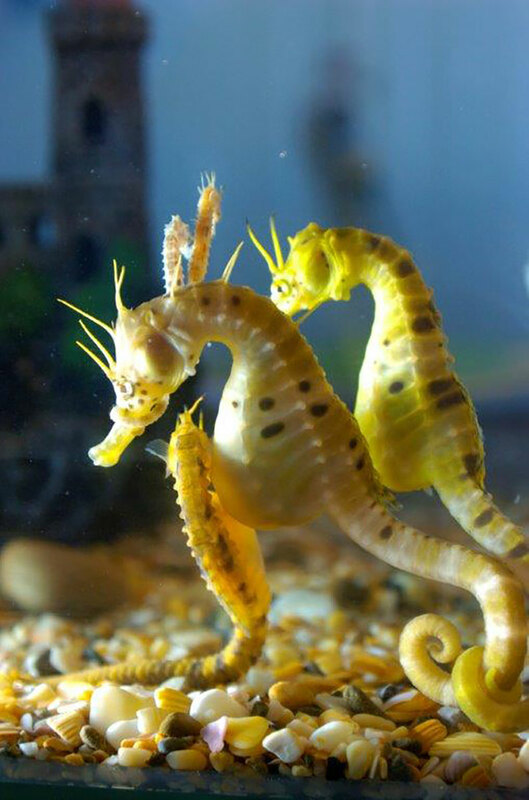 The seahorse’s graceful disposition, its ability to change colour for protection according to its surroundings, and long life span (up to 9 years in captivity), make it a wonderful addition to any home aquarium. It was the Southern Knight (Potbelly) seahorse species with which we established the farm in 1998. Since then, we have diversified to breeding several other species and also some other marine fish. Up to 28cm in length at 4 years of age (depending on diet and care). Large individuals give birth to over 300 fry per pregnancy. In the wild 3-4 births per male during summer. During winter, many males in a pregnant state. After a spectacle of a courtship, the female passes her eggs to the male, who fertilises them in his pouch. Males give birth to live young after a gestation period between 30 & 50 days, depending on water temperature. Previously mated females will mate with non-pregnant males during this time. Southern Knights are able to reproduce from 4 months of age. Unknown in the wild but probably up to 4–5 years. In captivity, 9 years has been observed. Great variety, ranging from silver-white, orange, black to dark gold. Some specimens heavily spotted, others without spots. Male pouch distinctively white, darkening during pregnancy. Many individuals have a ‘crown’ adorning their head, which is highly sought after in the aquarium trade. In the wild, live crustacea and small fish. Seahorse Australia’s captive bred Southern Knights readily accept live and frozen mysis shrimp. These foods are sold in pet and aquarium shops.